D. M. Gobble, age 82, of Leoma, TN passed away Wednesday, November 28, 2018 at NHC Healthcare of Lawrenceburg. He was a native of Lawrenceburg, TN, retired owner of Gobble Brothers Construction, a member of Pea Ridge Church of Christ, and a Mason. 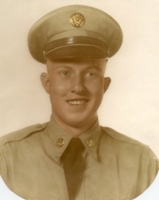 Mr. Gobble served his country honorably in the U.S. Army during the Korean Conflict. He was preceded in death by his parents, Delbert and Beulah Clayton Gobble; his wife of 56 years, Joyce Marie Morgan Gobble; one sister, Basil White; and one brother, Bill Gobble. Arrangements are being handled by Neal Funeral Home, 231 N. Military Avenue, Lawrenceburg, Tennessee. The family will receive friends from 10:00 AM to 2:00 PM Friday, November 30, 2018 at Neal Funeral Home. Funeral services will be conducted at Neal Funeral Home at 2:00 PM Friday, November 30, 2018, with Jeff Leonard officiating. Interment will follow at Gobble-Luna Cemetery in Westpoint, TN with full military honors. Family suggests memorials be made to St. Jude Children's Research Hospital, 501 St. Jude Pl., Memphis, TN 38105-9959.